Posted By Alan, 12th Jan 2017. 3 Minute Read. If your bathroom allows for a freestanding bath to adorn the room then I’m sure you’ve considered this luxurious option more than once before. Not just for traditional settings, freestanding baths also come in a variety of designs and sizes in contemporary styles too. 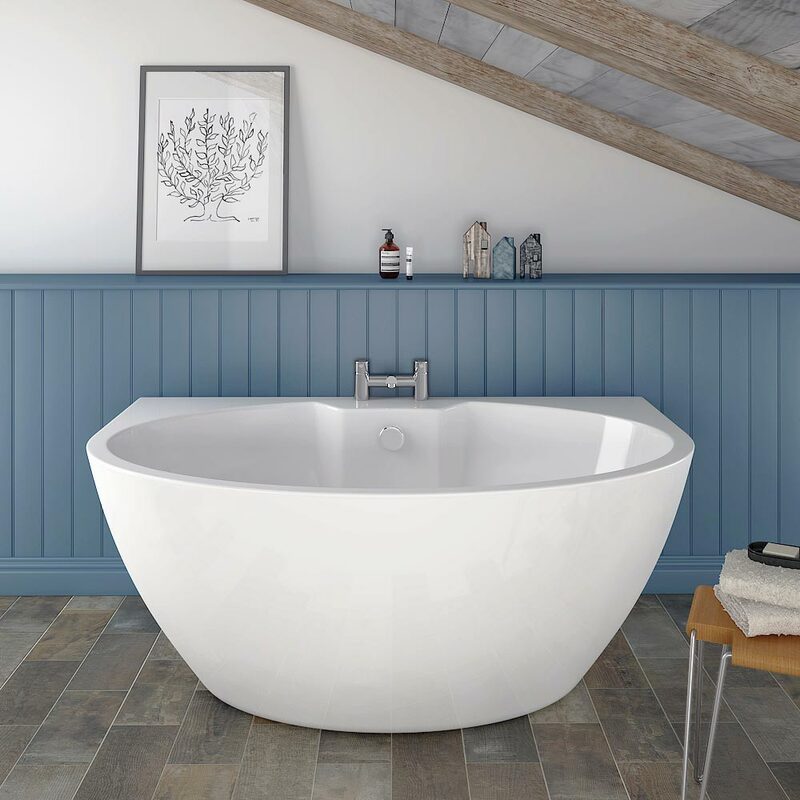 In this week’s ‘What’s Your Budget’ (WYB) feature we soak up what’s on offer and handpick 5 freestanding baths under £500. What’s your budget for a freestanding bath? Can you buy a freestanding bath for less than £500? WYB finds out! A freestanding bath is a bathtub which doesn’t need to sit against a wall for support or require bath panels. Unlike standard baths, they are designed to be a feature item which can be positioned anywhere in a bathroom, although there are back to wall (BTW) options available too. You can choose between modern and traditional styles to complement your own individual bathrooms and taste. They’re certainly a luxury purchase; built using a variety of quality materials including natural stone, cast iron and strong acrylic and finished with quality and attention to detail. Not everybody enjoys buying anything on a budget and the same goes for freestanding baths. Some baths in this category sell for a staggering amount of money like this Heritage Madeira freestanding bath which is made of cast iron and costs over £3000. It’s a beautiful bath but it doesn’t come within a budget of £500. The beauty about freestanding baths is that you can get the exact same look and excellent quality without parting with thousands. There are lots of freestanding options so look for materials such as acrylic and a smaller size if you do find yourself struggling to stay within budget. Are there freestanding baths within a £500 budget? The good news is yes, there a lots of freestanding baths under £500. We’ve listed 5 freestanding baths below which we think give you the most for your budget. We’ve picked them from both modern and traditional categories to ensure there is something for everybody here. As always the list is in no particular order this list is not a definitive list of freestanding baths which cost less than £500. 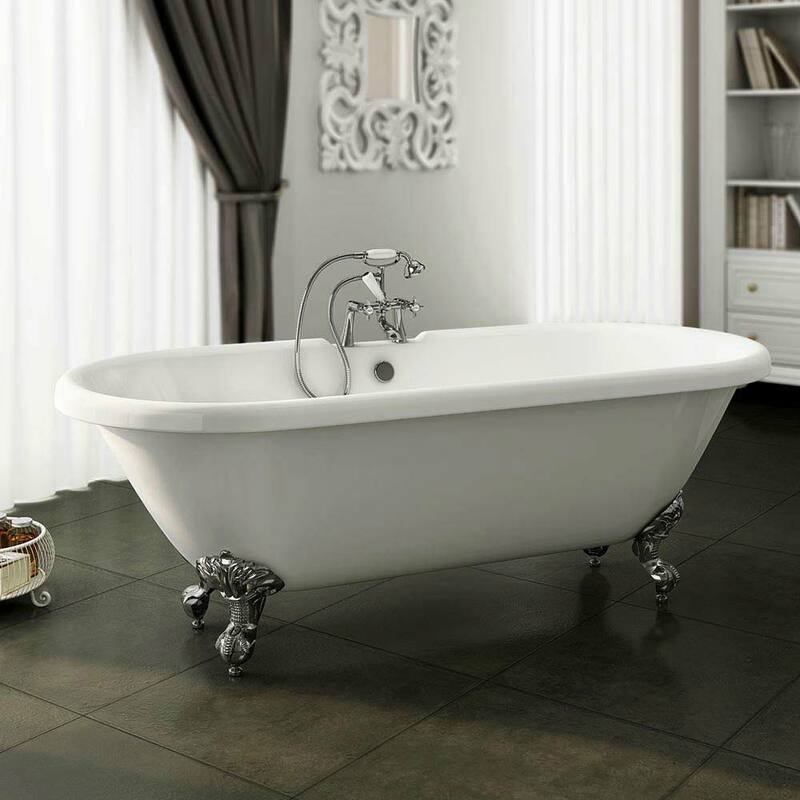 The Turin 1665 modern slipper freestanding bath is a stunning example. Its large water capacity makes for an elegant soak and its contemporary feel is perfect for a modern bathroom. It’s made from durable acrylic which produces a sleek and shiny finish. Its bateu design means that it sits flush to the floor with no feet required adding to its minimalist character. What could you buy with the change? 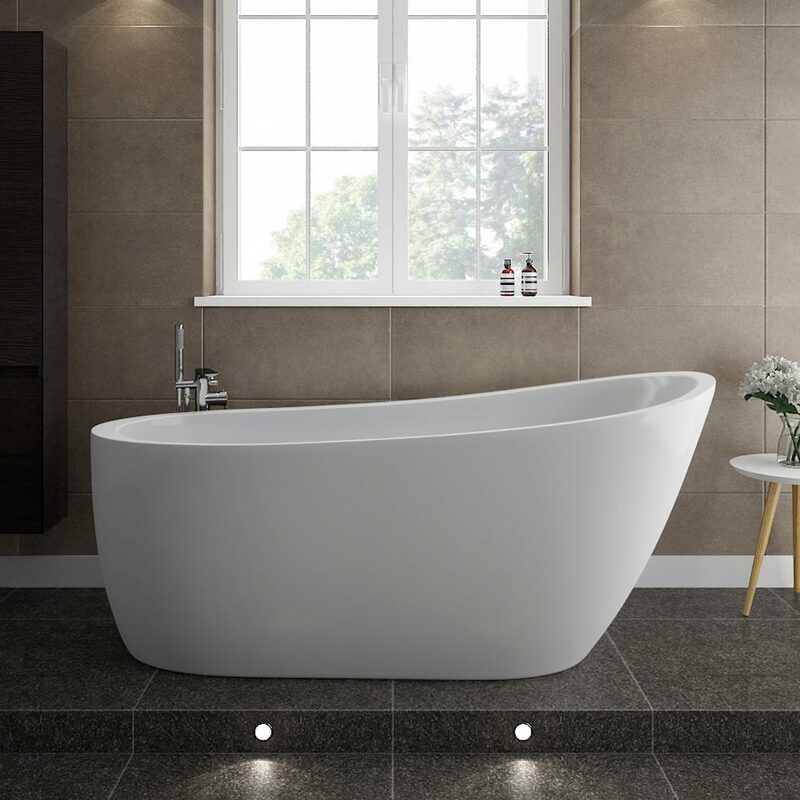 This freestanding bath really stretches a £500 budget which means you’ll get very little change to buy anything else, but who cares, you now have a beautiful bath to relax in! The luxurious Duke traditional roll top bath adds a wealth of character to a classically styled bathroom. The addition of chrome ball and claw feet finish off this bath in spectacular fashion. A strong and shiny acrylic makes this bath tough, yet beautiful to look at and complementing any traditional setting. The Duke would quite easily take centrestage in your bathroom. What could you buy with the change? As the Duke freestanding bath comes under £450 it means there’s enough money remaining to put towards these beautiful Belmont bath shower mixer taps! Not all freestanding baths are positioned away from the wall and the Orbit back to wall freestanding bath is an excellent choice for those who want this option. Indulge yourself: Made from high grade acrylic, this super-strong bathtub also holds 198 litres of water which is one of the largest capacities of freestanding baths in this range. What could you buy with the change? Receiving just 5 pence change from a £500 budget for such an exclusive freestanding bath will deter very few individuals! 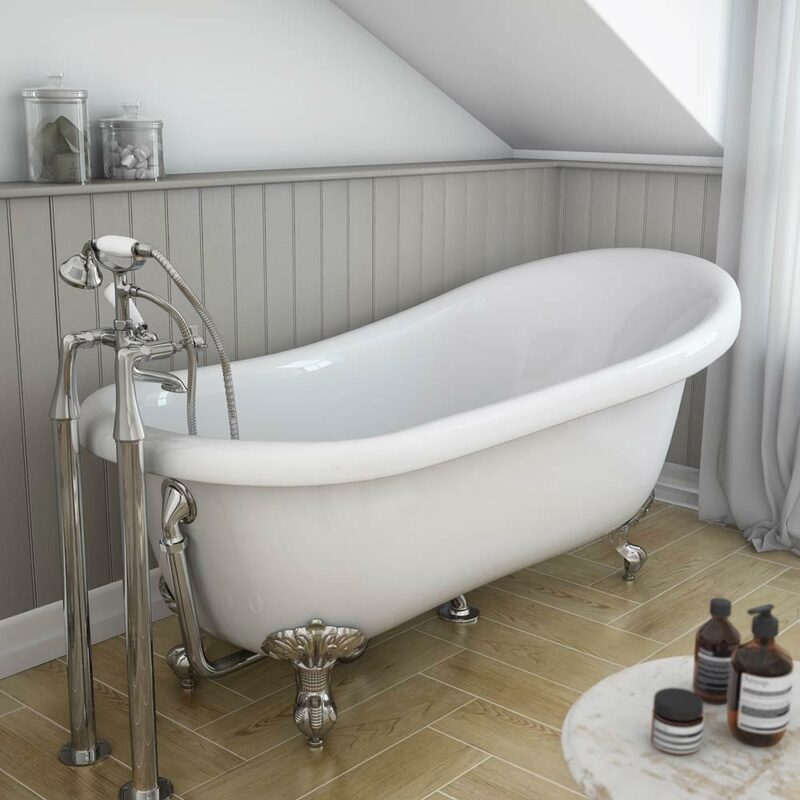 The Astoria roll top slipper bath epitomises the traditional freestanding bath. Featuring the characteristic chrome ball and claw feet, it will appeal to many classical bathroom owners. Utilising twin-skinned acrylic for extra durability and strength, The Astoria freestanding bath is perfect for a family bathroom but chic enough to feature in a stately home’s main bathroom suite. What could you buy with the change? Why not take your 5 pence change and put it towards these chrome plated standpipes to create an authentic finish with a beautiful set of traditional bath taps. 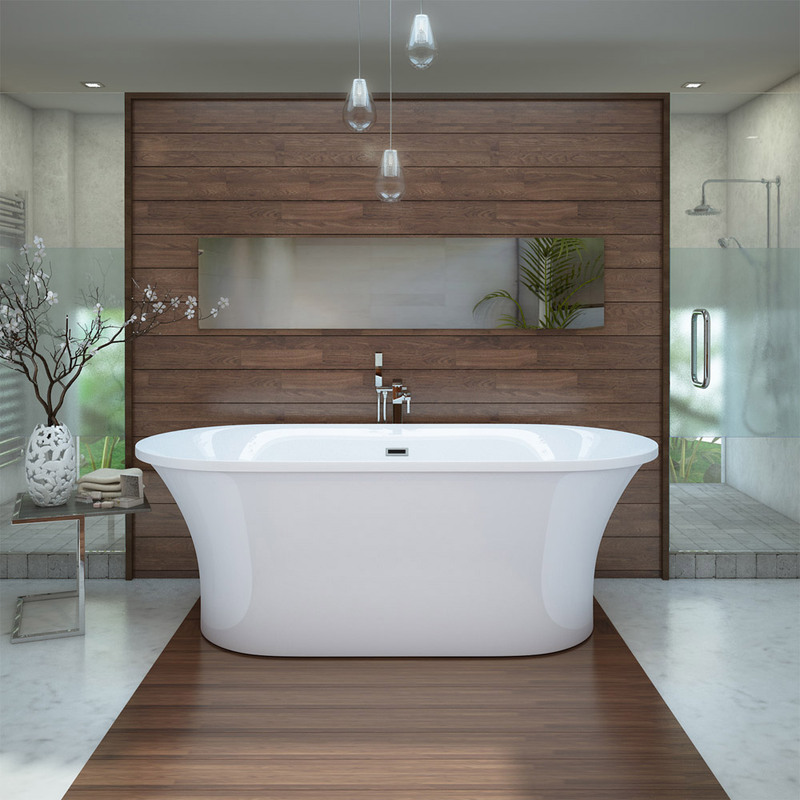 The truly breathtaking Eden 1750 modern roll top freestanding bath is a striking contemporary design perfect for making a statement in any modern bathroom. It can be complemented by floor standing or wall mounted bath fillers. This combination of bathtub and taps will certainly turn heads and create a focal point within your bathroom. What could you buy with the change? Use the remainder of your £500 budget to grab the Madrid floor mounted freestanding bath shower mixer to create the ultimate wow factor. What can a £500 budget do for you? A budget freestanding bath for under £500 does not sacrifice on quality or style as you can see. You’d expect to be totally limited on both choice and quality, but in reality you’re actually spoilt when it comes to options. Either consider one of our 5 top freestanding baths or take a look for yourself. An easy way to narrow your search is to start by asking yourself do you want traditional or modern? This article has picked freestanding baths for your £500 budget but hasn’t factored in the cost of additional accessories. We have tried our best to complete each freestanding bath with money left over from your budget, but you need to be aware that bath taps, plugs and wastes don’t always come with your bathtub so you’ll need to purchase these separately. We hope you enjoyed this week’s WYB feature and find it useful when you’re looking for a freestanding bath on a budget. If you have any suggestions, feedback or questions please leave a comment in the comments section below. If you know a friend who may benefit from this feature please feel free to share it with them via email or social media.